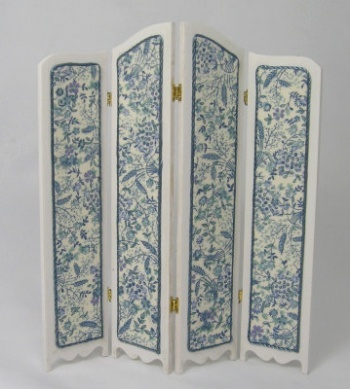 Make a lovely four panel screen to match your dollhouse decor. 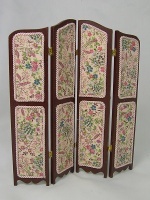 Kit includes laser cut wood panels, cardstock panels for fabric panels, hinges and instructions. No fabric provided, use your own fabric to match your room decor. Add small cording or braid if desired to edge fabric panels - optional. The wood panels can be stained or painted. Fabric panels can also be divided as shown in additional photos below. Note: brass hinges are included, and require assembly before applying to screen. Height: 5 3/9" at tallest point.